Northern Rocky Mountains Park is the largest of all the parks in the Muskwa-Kechika Management Area and the third largest provincial park in BC. It was established in June 1999 and encompasses 665,709 hectares of wilderness in northeastern BC. Northern Rocky Mountains Park includes Wokkpash, a former recreation area that was recently upgraded to Class A park status. The area borders Stone Mountain Park to the northwest and Kwadacha Wilderness Park and Recreation Area to the southwest. Together, these areas protect a vast portion of the northeastern mountain landscape, creating an unparalleled contiguous wilderness. The Eastern Muskwa Ranges, Muskwa Foothills and Muskwa Plateau eco-sections are represented in Northern Rocky Mountains Park. The Park landscape consists of a series of northwest-southeast trending valley and ridges. Broad U-shaped river valley bottoms, mountain cirques and morainal ridges are the result of glaciation. The mountains in the Muskwa Range have steep eastern faces with gentler grades on western aspects. Peak summit elevations range from Mount Mary Henry at 2641 m to Mount Sylvia at 2942 m. In comparison to the southern Rocky Mountains, the Muskwa Ranges are older and generally show evidence of more complex tectonic deformation that results in spectacular geological features. The diversity of water features is one of the outstanding draws of the Northern Rocky Mountains Park. The area is blessed with major rivers, clear, cold streams, waterfalls, rapids, glaciers and lakes. The rivers include the Tetsa, Chischa, Tuchodi and Muskwa and the main creeks are the Gathto, Kluachesi, Dead Dog and Chlotapecta. All creeks and rivers in the Northern Rocky Mountains flow into the Muskwa. Kluachesi and Tetsa are examples of the larger lakes in the area, but the largest and most important water recreation feature in the Northern Rocky Mountains Park is the upper and lower Tuchodi Lakes. Biogeoclimatic zones to be found in the Northern Rocky Mountains Park include the Boreal White and Black Spruce, Spruce Willow Birch and the Alpine Tundra. The valley bottoms are dominated by white spruce and aspen forests, and are replaced by sub-alpine fir and white spruce at higher elevations. Alpine plant communities consist of grasses, dwarf willows, sedges, forbs and lichens. The park also has numerous wetlands and native grasslands. Old growth white spruce forests can be found along the major river valley bottoms. Activities in Northern Rocky Mountains Park include scenery and wildlife viewing, angling, boating, hunting, adventure tourism, camping, hiking, horseback riding and nature photography. The Park offers an exciting array of visual and recreation features and opportunities for the backcountry adventurer. Recreational use is primarily during the summer and autumn months. For the rest of the year, the area is virtually uninhabited. A diverse variety of wildlife inhabits this northeastern mountain landscape. The area provides high quality habitat for moose, elk, stone sheep and mountain goat. The abundance of prey supports predator species such as wolves, grizzly and black bears. Other important wildlife includes furbearers such as marten, fisher, weasels and wolverines. Information on small mammals, amphibians, birds, invertebrates and reptiles is relatively unknown. Lake trout, rainbow trout, bull trout, arctic grayling and lake whitefish are some of the important sport fish species in the Northern Rocky Mountains Park. Wilderness paddling trips in the park are only recommended for experienced paddlers. The Tuchodi River offers a multi-day trip starting from Tuchodi Lakes (air access only) down the Tuchodi River to the Muskwa River and on to Kledo Creek boat launch, which is accessible from the Alaska Highway. The Muskwa River provides a multi-day trip starting just below the upper canyon on the Muskwa River (air access only via helicopter) to the Kledo Creek boat launch, which is accessible from the Alaska Highway. 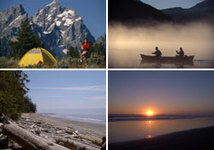 Wilderness, backcountry and walk-in camping are allowed, but no facilities are provided. There are many primitive campsites along the major river courses. Most of the main rivers and creeks have trails that were established by guide outfitters, but few are well maintained. On the Wokkpash Trail, a public use cabin is available at the south end of Wokkpash Lake. Northern Rocky Mountains Provincial Park is located approximately 90 km southwest of Fort Nelson, bordering on the Alaska Highway (no. 97) along its northern boundary. Access to the park is by riverboat, aircraft, hiking or horseback.